Parfums MDCI offers an enchantment of exquisite fragrances which are enhanced by the emotional beauty of the bottle and the stoppers. 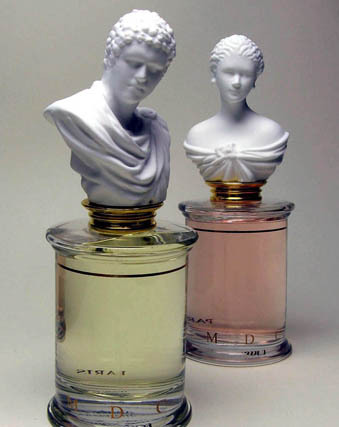 MCDI is a small yet prosperous company in the heart of Paris, and they operate by recruiting top perfumers and giving them the complete freedom to explore any direction and to create magic. Each bottle is made with someone's heart and soul, combining the passion of natural oils and wildflowers with the painstaking precision of making new, unforgettable fragrances. 2 Complimentary MDCI samples with a purchase of MDCI products. Chypre Palatin Eau de Parfum Spray 75ml by Parfums MDCI. Cio Cio San eau de parfum spray 75ml by Parfums MDCI. Fetes Persanes eau de parfum spray 75ml by Parfums MDCI. Invasion Barbare Eau de Parfum Spray 75ml by Parfums MDCI. Le Barbier de Tanger eau de parfum spray 75ml by Parfums MDCI. Nuit Andalouse Eau de Parfum Spray 75ml by Parfums MDCI. Peche Cardinal Eau de Parfum Spray 75ml by Parfums MDCI. Promesse de L'Aube Eau de Parfum Spray 75ml by Parfums MDCI.